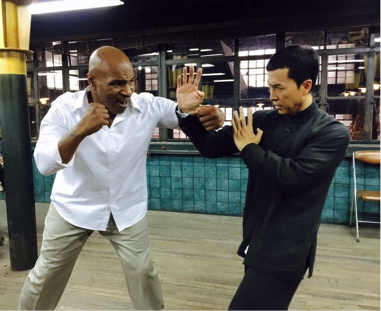 Ip Man 3 is the last installment of the Ip Man series which started in 2008, starring Donnie Yen as the title character, with the same team of Wilson Yip directing and Raymond Wong producing on all three films. Venerated stunt choreographer Yuen Woo-ping handles the action. One of the strengths of this series is that all three movies are of a piece, with one movie picking up close to where the previous one had left off. This one opens with Master Ip practicing on the wooden training dummy (the same opening shot for the previous two), finally settling into life in late 1950s Hong Kong. He’s established his martial arts school, popularizing his Wing Chun style, so much so that he gets a visit from a face familiar to modern audiences, as a young Bruce Lee (Kwok-Kwan Chan) brazenly walks into Ip Man’s school and asks to be taken on. Ip Man, the historical figure, is best known in the western world for being Bruce Lee’s teacher and laying the foundation for Lee’s own martial arts philosophies, but in the movie, Lee is an overeager youngster in need of guidance, and his interaction with Master Ip is a little cameo for fans of kung fu history. The real trouble begins when local criminals, taking advantage of Hong Kong’s instability from its rapid growth, try to shut down the school attended by Ip Man’s son for the interests of an foreign gangster, played by Mike Tyson. (Yes, that Mike Tyson, who acquits himself well as a fighter but not as an actor.) The police are overwhelmed and Master Ip and his disciples are asked as a citizens’ brigade to help protect the school, which pulls him into the criminal underworld, culminating in confrontations with Mike Tyson’s character, Frank, and rival martial artists. What makes this installment distinct from the other ones is not the overwhelming amount or innovation of the action (please don’t misunderstand, the action is solidly entertaining if not revolutionary), but as a goodbye, both for the series and for Donnie Yen. Yen, who is now in early 50s, still has years left in his acting career (showing up later this year in Rogue One and Crouching Tiger, Hidden Dragon: Sword of Destiny), he has mentioned that Ip Man 3 might well be his last kung-fu action performance, although one would suspect that he will continue making action films or appear in kung-fu movies in non-fighting roles. When thinking of an American counterpart to Yen in terms of box-office draw and star power, the only one who comes close is Tom Cruise, and Cruise is certainly not slowing down in his 50s; I highly doubt Yen will. The shadow of Yen’s departure looming over the film, the last third takes a turn for the more dramatic, rather than strictly focusing on action. There is a trope in action movies, especially in martial arts ones, where the young fighter needs to establish his place, finding joy only in the violence of strength of arms. As the fighter earns the role of a master, repelling challenges one by one, he eventually wonders, as he ages, whether staying at the top of the hierarchy is worth the hassle. After all, staying at the top through sheer physical force is a young person’s game, and Master Ip is well aware of that, as this movie and the previous two in the series would show. But, how to solve this problem? Ip Man 3’s answer is to focus on the other forces in Master Ip’s life, to show that this character’s happiness is not grounded in the adolescence of direct competition, of skill against skill as proof of strength and value, but sticking to the important things, like love, family, and integrity. Master Ip’s life may be centered on teaching his style of martial arts, but martial arts isn’t the only thing in his life. 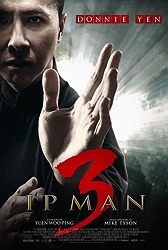 Although not quite hitting the heights of action in its previous installments, I found Ip Man 3 to be a satisfying emotional conclusion to the series that has been satisfying on so many levels: establishing Donnie Yen internationally as a superstar, and creating the most cohesively excellent and watchable trilogy of martial arts movies around. Donnie Yen is without a doubt one of the finest martial arts stars that has ever been. I hope this isn't his last action flick, but if it is, I know I'll enjoy the films he has blessed us with for the rest of my life. It makes me want to cherish the upcoming Crouching Tiger movie that much more. Also, I hope that is good, but the trailer has me a little worried. That version of "Bad Moon Rising" didn't do it for me. Great review Mark! When I went to see Ip Man 3, I really was not expecting to be even close to tears, but after two movies building a relationship with this guy, and in retrospect creating quite a tragic relationship between him and his wife it was really sad to see the turn that story takes and then yeah, really satisfying to see the end of Ip Man's journey like that. I thought there were also two stand out fights in the movie, the one with the Thai boxer (I assume it was boxing? Don't have much knowledge about these fighting styles), and the final fight, so it was good that the movie at least had those. One weird thing I've noticed about the Ip Man movies, and this might just be in my reaction, but they always seem to do a weird 180 at some point in the movie. The first one is all like 'it was a peaceful time and Ip Man easily defeated some bandits' and then WAR, the second is all like 'Ip Man tries to set up a Wing Chun school' and then ROCKY MOVIE, and the third is all like 'some bandits try to take over a school and people punch each other' and then EMOTIONAL DRAMA. I dunno, always seems weird. And yeah, gotta love Donnie Yen! The guy exudes humility in all three of the Ip Man movies. Tristan - I totally hear you about the weird 180. It sort of feels like a studio note or something. A lot of Chinese movies are financed by several different places (which you can see in the opening credits), and I wonder if the story is strangely warped because of financial or studio constraints. Hard to tell.